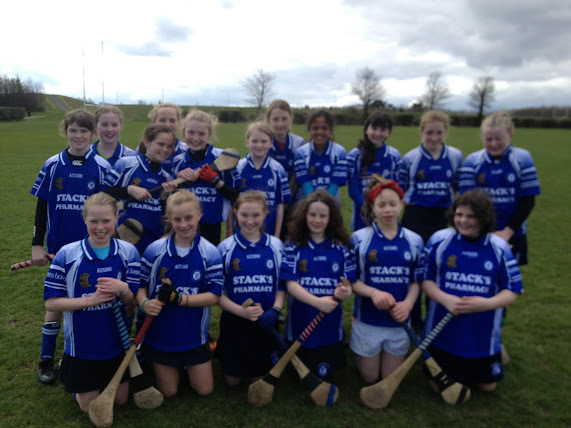 It’s high noon on Saturday, the sun is bright and the U12 Camogie panel gather at Skerries Mills Car Park. They grab a jersey and decide who is going in who's car and they, their supporters and coaches head off to Tymon Park to play Faughs Celtic. 17 of the panel travelled, the remaining 4 are suffering from injury or sickness (hope you recover quickly girls). Once there Megan Carroll led the prematch stretches and once warmed up the starting 11 took their places. Playing up hill and into a wind Skerries exerted considerable pressure early on with a number of attempts at goal, unfortunately all wide. By this time the Skerries girls were starting to show some of the skills we know they have with some good strikes out of hand and winning most of the 50/50 balls. Five minutes later and it's Skerries' second goal, Hannah Coleman with a great aerial strike from distance blocked by the Faughs ‘keeper and Sarah Farmer is there again to put it in the back of the net. takes it herself and fires it into the top corner of the net. The first half was all Skerries pressure with the midfield of Jessica Anyanwu and Claudia Herbert dominating and the half backs Megan Carroll and Claudia Gormley not letting anything past them. Sarah Farmer wrapped up the half by completing her hat trick, scoring from another ball from Dayna Morgan. continues. Within five minutes Abby Price, now on at full forward, steers the ball into the net. This was followed by a great strike by Alanna Holland from about 15 metres out which gave the ‘keeper no chance and had spectators behind the goal jumping out the way through fear the ball would burst through the net. Hannah Coleman added to the score with another fine strike that the ‘keeper could not reach. Kyana McGuinness was providing fine balls in from half forward and it was one of these led a goal from Danu Holland. Pressure was being exerted all around the pitch by the Skerries girls however fair play to Faughs they kept going and got a breakaway. Anje Ni Chuin chased back and did enough to put off the Faughs attacker and the shot rolled to now ‘keeper Hannah Coleman. Mary Halpin was moved up to half forward and immediately got stuck in, unlucky with her first attempt on goal but scoring with her second. The scoring was rounded off with a fine strike by Megan Carroll. Then came the final whistle and after the customary shaking hands with the opposition the girls made a beeline for the park playground. Well you couldn’t deny them could you!! Thanks to the travelling support, considerable in number as ever.